HOT "ROMANCE" AT KUMU KAHUA: Stage manager Lynne Nohara, seated left, celebrated with director Kati Kuroda and the cast of Kumu Kahua's production of "The Romance of Magno Rubio" at the opening-night reception March 13. Joining them on the bench were Cheyne Gallarde, second from left, and Troy Apostol. Standing were Wayland Quintero, left, Lito Capina and M.J. Gonzalvo. The men deliver a superb ensemble performance in playwright Lonnie Carter's look at the lives of Filipino migrant workers in California in the 1930s. Apostol stars as a naive idealist who falls in love with a woman he meets through a singles' ad. Sit in the small Ewa section of the theater to see Apostol's finest work in the final scene. The show closes April 13. Call 536-4441. THUMBS DOWN, THUMBS UP, FOR "21": Hawaiian KINE 105's Bill "Billy V" Van Osdol and fashion designer Puamana Crabbe were in the house Wednesday for a preview screening of "21" at Dole Cannery. Van Osdol described the crime drama about MIT students scamming Las Vegas casinos as "entertaining but predictable." Crabbe saw it as "'The Sting' fast-warp-speed to the 21st century." "AIDA" CAST PARTIES AT COMPADRES: Shawna Masuda (Amneris), left, shared a booth with ensemble members Chris Villasenor, Hannah Long and Myles McGee when the cast of Army Community Theatre's production of "Aida" celebrated March 8 at Compadres. Masuda's performance captured all the comic elements of the role but made Amneris a tragic heroine as well. 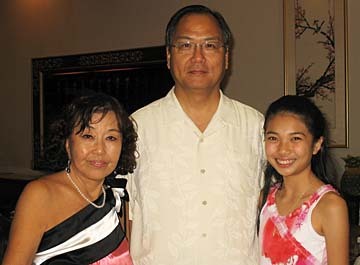 CHU HONORED: Singer/actress Allison Chu, right, was the guest of honor at an elaborate dinner co-hosted by her grandmother Julia Chu and Philip T.Y. Wang, director general of the Taipei Economic and Cultural Office in Honolulu, March 21 at Hong Kong Harbor View Restaurant. 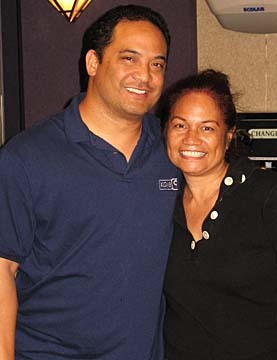 The dinner commemorated Chu's show-stopping performance as Maria in Kaimuki High School's production of "West Side Story." 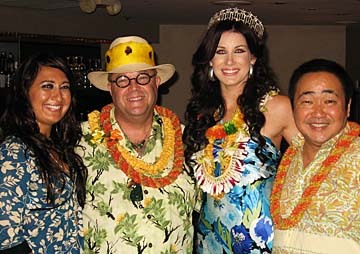 A BIG NIGHT FOR LAYFIELD: Miss Hawaii USA 2008 Jonelle Layfield, wearing the crown, welcomed Jasmine Ornellas, left, Eric Chandler and Takeo Kobayashi of 2 Couture to her pau hana fundraising party March 17 at Rumours. March was a big month for Chandler and Kobayashi, as well; the two fashion designers received Legacy Awards from the Music Foundation of Hawaii on March 12.